Lacrosse, historically a sport played more in the Mid-Atlantic and Northeast, continues to expand. Last night, lacrosse was sanctioned as a high school sport for both boys and girls in South Carolina, the 19th state to do so. North Carolina may soon follow suit, showing the growing popularity of the sport. Roughly 60 mens and 90 womens teams already compete at the NCAA Division I level. In South Carolina, lacrosse will be played from January to April. I recall the meteoric growth of this sport while living in Central Florida. Brian Logue, director of communications for US Lacrosse, says lacrosse’s popularity continues to soar in Florida, Texas and Colorado. You may want to learn more about lacrosse because, odds are, you may be covering it sometime in the future. As with any sport, do not attempt to get too technical in your coverage, mostly because your readers may not know the esoteric terms either. I’d speak with a coach before heading out to cover a game for an informal lesson on how lacrosse is played. That’s good advice for any sport you have never played, really. What’s an assistant coach worth? Sometimes, we need to challenge absurd quotes. Sometimes, though, we just need to throw them out there for the reader to assess – especially when the comments, or logic, are ridiculous. That’s what USA Today’s Steve Weinberg and others did this morning in reporting that a Kansas State associate basketball coach would now earn $420,000 per season. That’s $80,000 per year more than university president Jon Wefald. Dalonte Hill is in his third year at K-State. Head coaches, of course, make much more money. Some critics say these salaries are absurdly high – such as the $4 million paid to Alabama football coach Nick Saban and the $3 million paid to Kansas basketball coach Bill Self. But that’s another argument. The absurdity here is how K-State athletic director Bob Krause defends Hill’s salary: “Yeah, it’s important to recruit. But his compensation (was for) responsibilities that include game preparation, recruitment, bench coaching, scouting. It kind of does him a disservice.” This comment probably prompts readers to think about the injustice of it all, that a third-year assistant coach can earn more than the person charged with running an entire university (and athletic program). That’s an idea that’s a disservice to us all. Kris Knowlton focuses on an aspect of football in the Daily Nebraskan that is not familiar to all fans – the pancake block (as opposed to cockroach and rodeo blocks.) 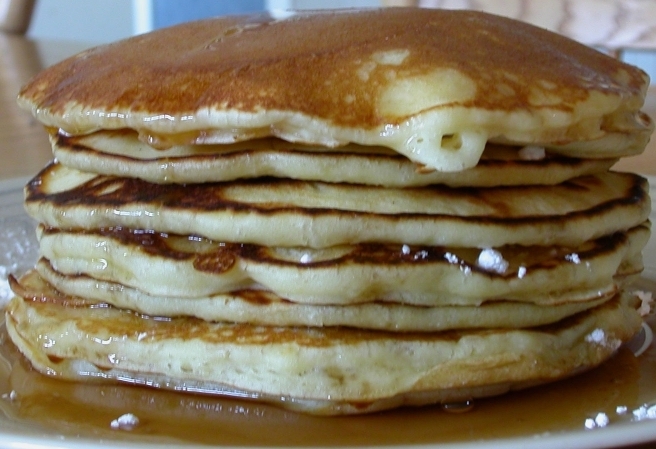 The pancake is essentially a block where the opponent is forcefully knocked back and flattened like a Bisquick flapjack. Blocks like this give line coaches warm fuzzies. DALLAS — Chris Ogbonnaya’s run toward a roaring sea of orange at the Cotton Bowl in the fourth quarter put an exclamation point at the end of Texas’ new No. 1 ranking. The senior running back’s 62-yard run to the 2-yard line with Texas up by three led to the game’s final score, a 2-yard Cody Johnson run, giving the No. 5 Longhorns a 45-35 upset win over No. 1 Oklahoma in Saturday’s Red River Rivalry. After Missouri and LSU, formerly in the top five ahead of Texas, fell Saturday, the Longhorns overtook second-ranked Alabama in the Associated Press Top 25 and USA Today coaches’ polls to score their first No. 1 ranking since October of 1984. Henry covers all the main elements – key play (62-yard run in final minutes), significance (Longhorns now are No. 1), context (two other top 5 teams lost during the weekend), and solid quote that emphasizes the lead’s focus. Imagine (but not too hard since you may forget all else) half-naked models running on a manicured grassy field, smacking their voluptuous bodies into one another – legs splayed, exposed, tight bellies breathing heavily above tiny bicycle briefs while another player adjusts her sports bra, (slightly) worried she may be exposing more than Janet Jackson ever dreamed. Apparently, playing in front of a packed football crowd is as difficult as we all had imagined. As Tennessee Titans tight end Bo Scaife once told Longhorns coach Mack Brown: “Coach, I think I’m hyperventilating.” Stories like this are a joy to read. The Daily Texan covered nearly many angles on the 103rd game between No. 5 Texas and No. 1 Oklahoma. The newspaper posted stories that reflected on last year’s game, analyzed some match-ups, and offered some commentary. Would have also liked a slightly more traditional piece that also examined the match-ups, offered assessments from Oklahoma’s players and coaches, and put the Red River Rivalry into more perspective. Meanwhile, the Oklahoma Daily offers a story with that kind of analysis, showing, for example, how Texas linebacker Roddrick Muckelroy leads a defense that allows only 51.8 yards rushing per game. Sportswriter Kyle Burnett also includes comments on the match-ups from coaches and players. This is a pretty good story, one worth reviewing. As always, this story would have been better – and more insightful – had comments from the opposing team been included. Yes, getting comments from opposing teams can be a challenge, but plan early – call sports information directors at other schools early in the week to set up interviews. 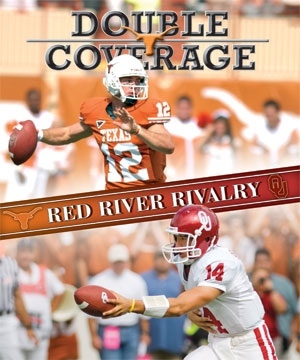 A second story, part of a three-part series on the rivalry, does include comments from Texas, which shores up a pretty good effort by the Oklahoma Daily on this highly anticipated game. 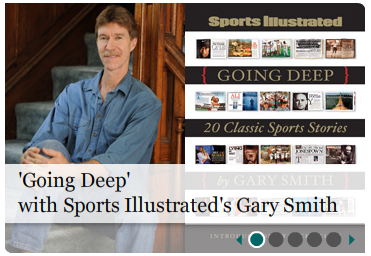 Readers of this blog know how much I admire Gary Smith, perhaps the most talented narrative sports writer in the universe. That’s why I am so excited tonight. About 15 minutes ago, I found an interview with Gary Smith on Poynter’s website (required reading for all journalists) that has terrific advice and great insights into developing longer-form sports journalism. And there is a certain eloquent simplicity to his approach to journalism. For example, how does Smith reconstruct scenes so finitely? Smith: By asking a zillion questions. When I sense a scene could really be a compelling one, a revealing one, an important one, I’ll just think of a million little questions about what that moment was like. I talk to other people who might have had some glimpse into it as well. It’s basically painstaking questioning, really. And how does Smith craft those compelling conclusions? The other thing I’ve found is that ambiguity is where the reality lies. It’s much more honest. When you inspect yourself about what’s pushing you to make one decision or another, it’s usually this whole flux of things that are going on inside of you, a whole mixture of things weighing and leaning on the choices you make. It’s not that clean. So writing in a way that just irons out the wrinkles and gets you more to the black and white mode of human nature is really kind of dishonest. Welcome ambiguity and the complexity because it’s a lot closer to the truth. … There’s a gold mine there if you don’t try to skirt it. You must do two things. First, read Jemele Hill’s fine interview with Smith. And, second, read Smith’s collected stories, Beyond The Game. You’ll be a better sportswriter for doing this. Just received information on this terrific sportswriting opportunity. The Association for Women in Sports Media awards scholarships and paid summer internships to female college students pursuing careers in sports writing, editing, broadcasting, Web production and public relations. All interns receive a $1,000 scholarship, plus $300 toward travel expenses to the annual AWSM convention, waived convention fees and free lodging at the host hotel. Copy editing interns receive an additional $1,000 scholarship from the Associated Press Sports Editors. Organizations that have hosted interns in the past include Sports Illustrated, ESPN, USA Track & Field, MLB.com and the St. Petersburg Times. Applications must be submitted via the online application system by Oct. 31. Any questions? Please, send an e-mail to AWSMintern@hotmail.com. 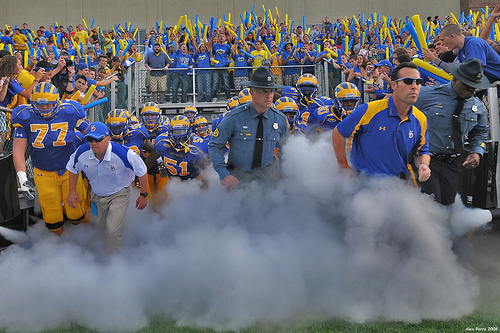 The Delaware Review's Alex Porro somehow did not get trampled while snapping this photo last week. That was not all Porro learned while covering the football game from behind a lens. It is approximately six o’clock Saturday evening and I am crouched against the goal posts in the south end zone of Delaware Stadium, my back pressed firmly against the blue protective padding. It has been drizzling for a few hours and the scent of mud and wet grass hangs heavy over Tubby Raymond Field. The green hedges which outline the field, fading as the weather cools, seem quaint underlining the raucous student section hungry for an important victory. The blue and gold clad Cockpit raps out an indistinct cadence on their Thunder Sticks as a “Who’s house?” chant starts up. My legs are burning from my crouched position and my heartbeat has picked up. In my hands is a Nikon digital camera worth more than anything I own, about $5,000, lent to me by professional photographer Bob Burleigh. Burleigh, who has been a sports photographer since he was 14, has worked for the university since 1999 and specializes in football. He agreed to let me use his camera for Delaware’s game against Albany to find out what goes into the perfect sports photo. He sets me up in a prime spot to shoot the players storming out of the tunnel before the game. “Don’t move or you’ll get hit,” Burleigh said. Porro writes like a photographer – visually, simply, eloquently. Readers can visualize this scene (blue protective padding, green hedges outlining the field, blue and gold clad Cockpit), feel it (legs burning, racing heartbeat, back pressed firmly against a pad, wet grass, cool weather), hear it (students chanting raucously ), and smell it (scent of mud). And that was just in the opening several paragraphs. The lead establishes setting while the second graph offers conflict, the key to any good story: A student-photographer is hoping he does not get trampled by 80 players storming out of a tunnel and, thus, will not break a $5,000 camera. Sportswriters can learn a great deal by following photographic principles. Last week, I presented a session on this topic at a state journalism conference with my friend and colleague, Brian Poulter, a terrific photographer in his own right. We will also present this session, on Writing Visually, at the College Media Advisers national fall journalism convention in Kansas City later this month. Stop by if you can make it. (BTW, I will present two sports sessions there as well.) In the meantime check out Alex’s entertaining and informative piece. And, oh yeah, the kid can also shoot pretty well. We are not experts. After years of reporting and studying a sport, sportswriters may gain a much greater understanding about football or baseball or track, but that still does not make us expert, just more informed than the average fan. Coaches, who devote their lives to their sports, know much more than we do about missed assignments, match-ups, and skills. That’s why we cultivate relationships with them. That’s why we cite them. Few readers care about analysis straight from a sportswriter. Really, what the heck do we know? Analysis from college sportswriters typically is perceived as even less informed. Before assessing the football team’s chances this weekend, you should speak with both opposing coaches and your school’s coaches. Want to really impress readers and editors? Then also call a coach whose team has played both teams and ask for a comparison. 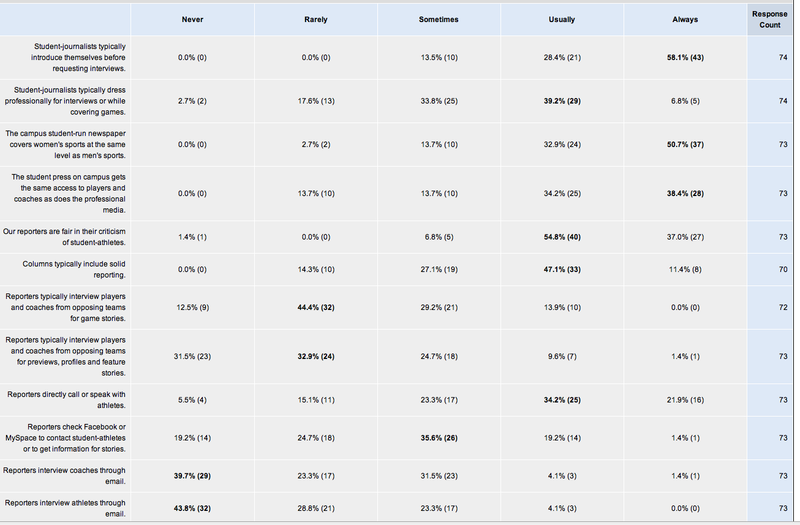 Offer examples, specific details and clear reasons to suport statements in analysis pieces and columns. Do not just offer general statements. Auburn can’t run. They can’t pass. At times they can’t even hold onto the ball. It’s not fair to a defense to have to carry the team week in and week out — even if it’s as dominant as Paul Rhoads’ squad. How many yards does Auburn average? How many times do they run the ball each game? What is the team’s completion average and what is the quarterback’s rating? Offer specific plays from games? How many times has the team fumbled – and have players lost the ball in crucial situations? None of those salient points are addressed in this analysis piece. Making unsubstantiated statements creates more questions than answers. Soccer coverage Arizona’s Daily Wildcat reporter Bobby Stover does a nice job previewing the women’s soccer team’s match this weekend. Apparently, Arizona was twice shut out last weekend. Stover leads with an anecdote at practice, ties that to the upcoming match, includes comments from coaches and players, and includes analysis and key stats. One key for the Wildcats will be to regain their composure offensively. Last weekend, Arizona barely touched the ball against its Friday opponent, Long Beach State. As a team, the Wildcats were outshot 12-5 with only three being on target. Fully develop leads. And make sure you connect support these opening statements. This week’s practices for the Ball State University soccer team have looked a lot like rugby. After a 3-0 loss to Central Michigan University a week ago, the team’s worst loss in two years, the Cardinals (5-5-0, 1-1-0 Mid-American Conference) raised their intensity to rebound with a 3-0 win against Eastern Michigan University. The intensity from Sunday’s win has carried over to practice this week, which will help Ball State win more games, coach Michael Lovett said. Unsure how the Ball State soccer team played like a rugby squad here. Did they get into scrums? Did they swing passes out to the sidelines and run down the field? The writer here seems to imply intensity is the explanation, but all good teams are defined by intense, determined play. And don’t be cutesy (or is that Cute-Z?) Here is a paragraph inserted into an otherwise pretty good soccer column at the Cornell Daily Sun: “It seems they have only two things in common. First, they have the skillz. (They get a ‘z’ on the skills because of just how important they are to this Red team. Chang has already scored two goals, for example, tied with two older players as Cornell’s scoring leaders. )” Please, cross out references like the one above.